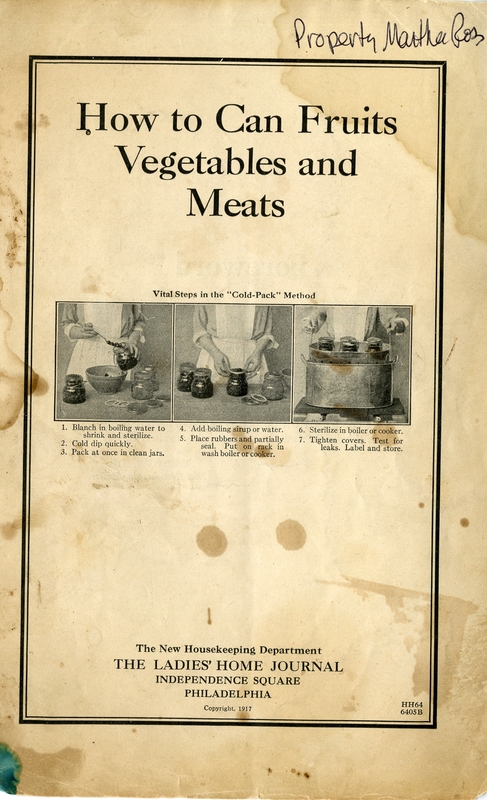 kitchen – What's Cookin' @ Special Collections?! Last December, we found a catalog description that intrigued us. When the item arrived, it was better than we imagined. 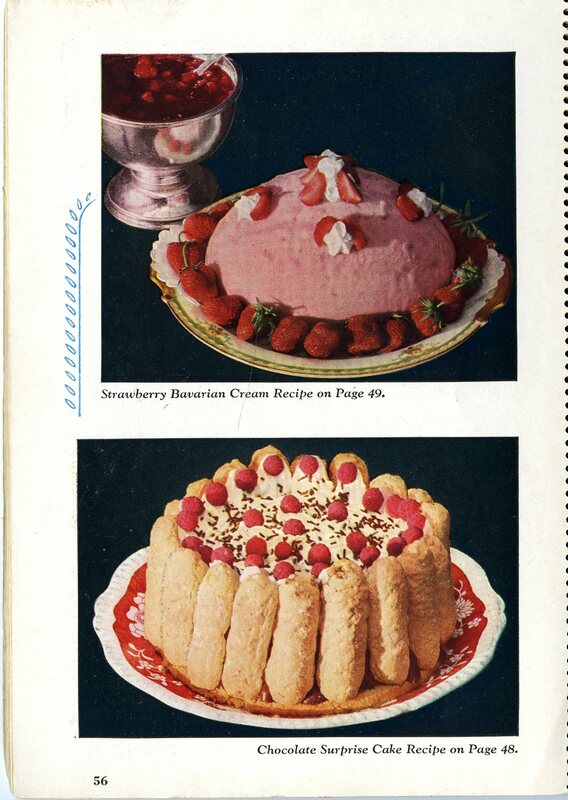 A scrapbook filled with cut out images from newspapers and magazines, depicting everything you might need to get started as a new homemaker. 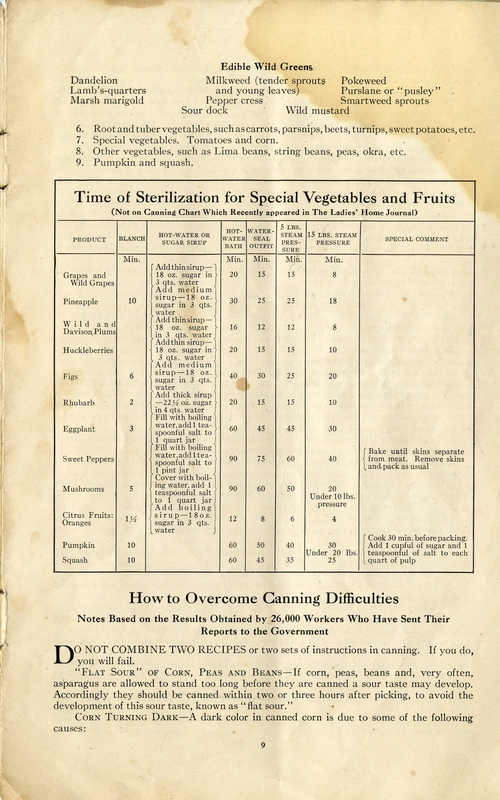 This scrapbook, wonderful as it is, reflects one of the challenges for archivists. Sometimes, when we acquire an item or a collection, it’s obvious. We know the who, what, where, why, and when of it. Sometimes we think we know, discover we’re wrong, and find out something new. And other times, we get, well, a scrapbook like this. Organized closets make it much easier to find things. It never hurts to be over-prepared for the cocktail hour. 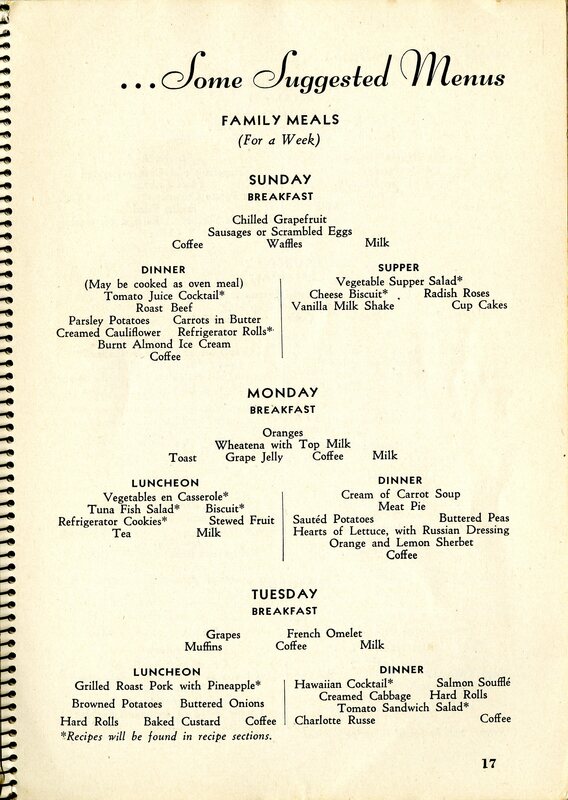 Plan your menu, especially if you’re having company. We hope to be posting the whole scrapbook for online viewing in the near future, as we’re experimenting with some new software. 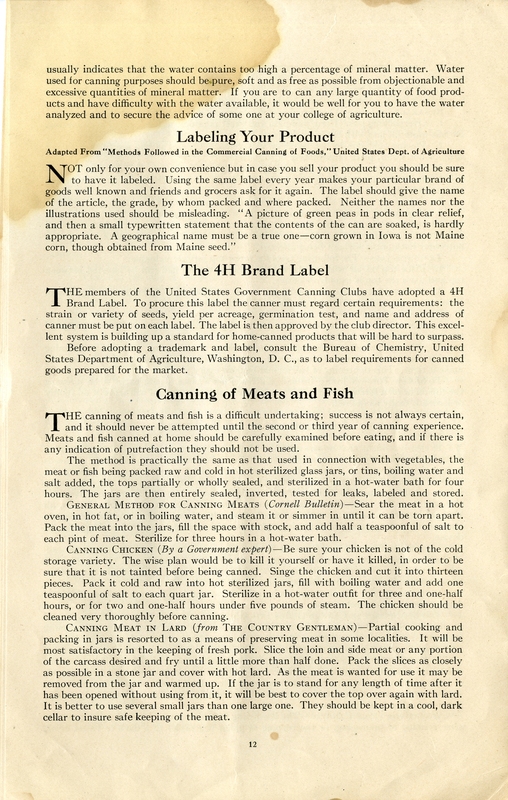 (Currently, you can view the finding aid here.) Once it’s all set, we’ll be sure to post an update! Or, come by and see it in person! Convenience and efficiency are a common theme in the collection here. 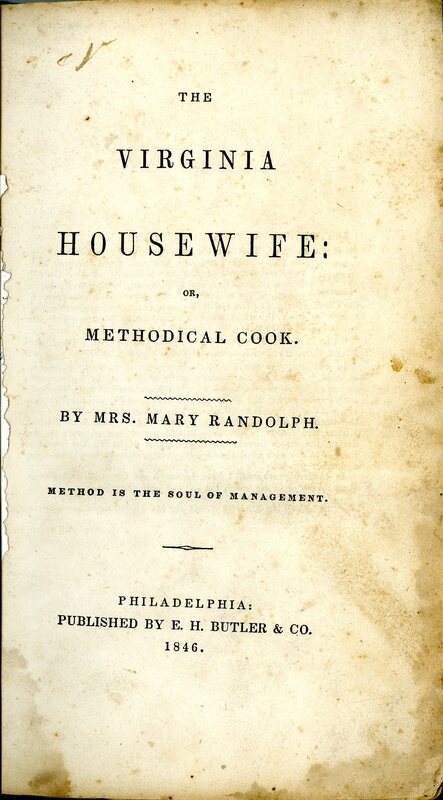 Growing middle classes in the late 19th and into the 20th century meant women were responsible for managing the kitchen and preparing food. 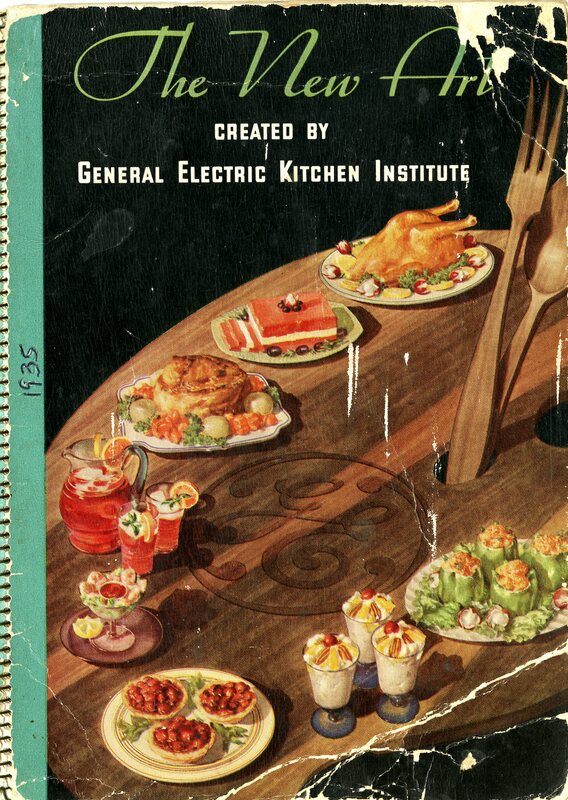 In 1934, the General Electric Kitchen Institute offered this handy little home helper: The New Art of Buying, Preserving, and Preparing Foods. 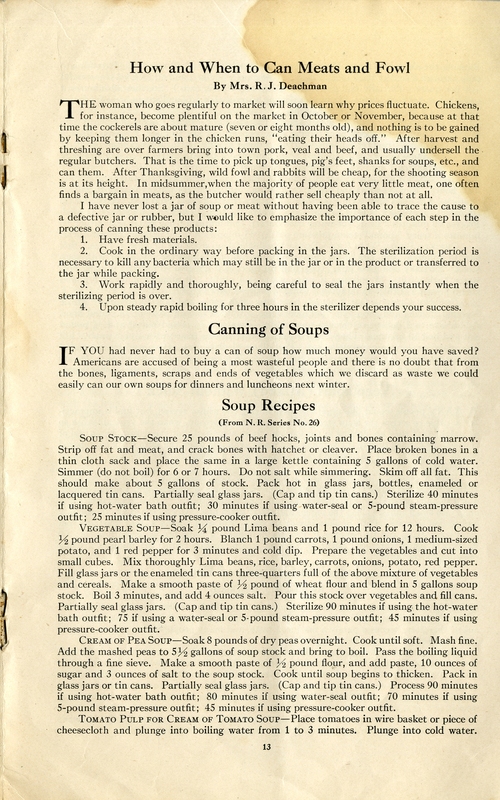 The book includes tips for home management, advice for how to modernize your kitchen, recipes and meal planning, and details on how to use modern appliances to improve feeding one’s family (especially the refrigerator, the range/over, the electric mixer, and the dishwasher). “The most important room in the home has now become the most enjoyable. 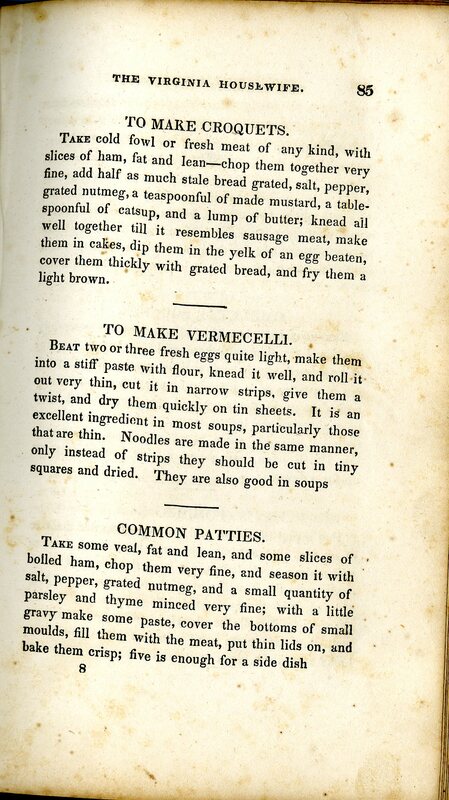 No longer is the modern woman tied down to monotonous hours of kitchen routine. 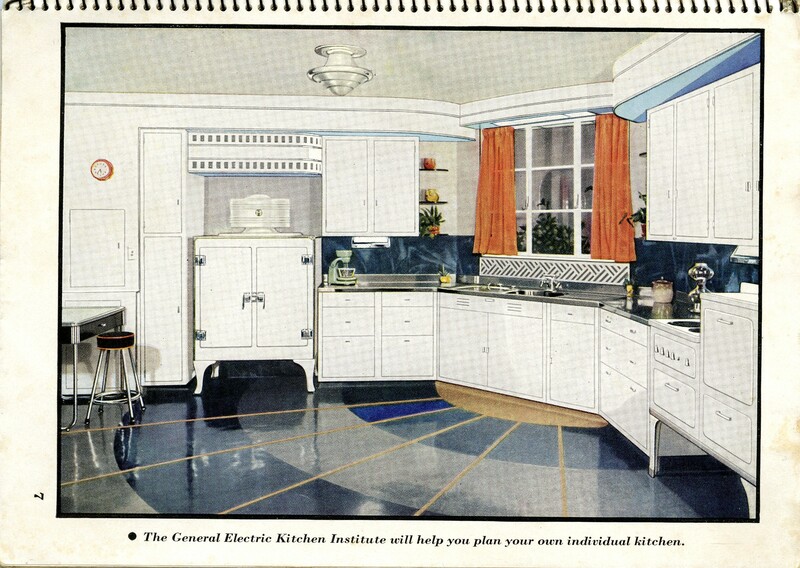 Magic electric servants work for her, giving her new joyous hours of freedom–hours she can spend in any way she chooses.” The G-E Kitchen Institute was even offering personalized directions on how to modernize kitchens for women who sent a sketch of their current set up! 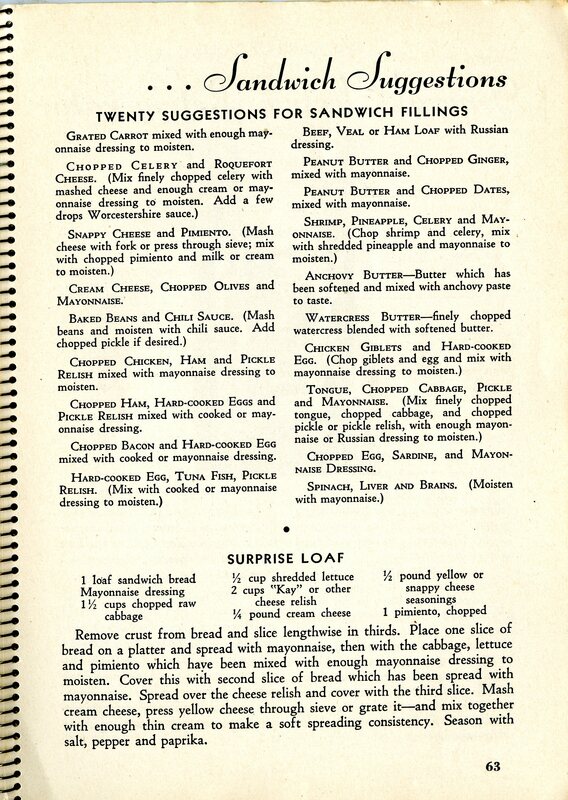 The book includes suggested menus for all kinds of meals, from family dinners to entertaining at a bridal shower, as well as recipes for every course. 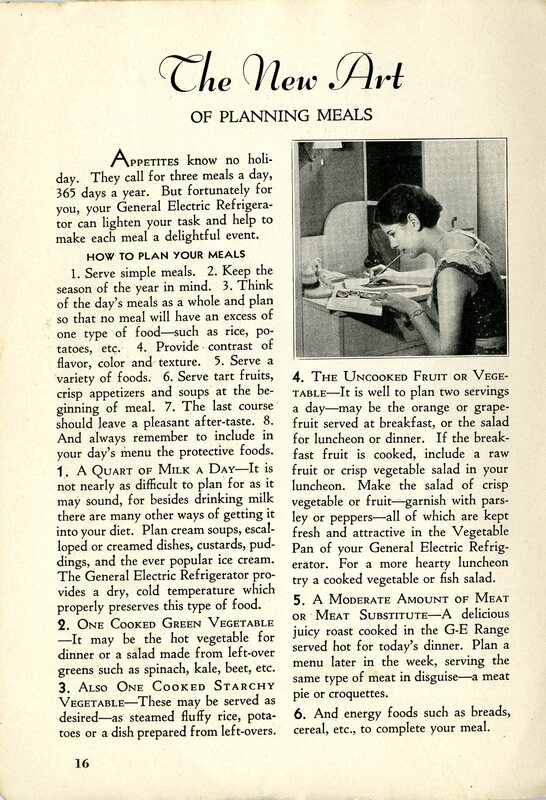 But there is an emphasis on convenience and speed (“Today in over 1,000,000 American homes, electric cookery does in minutes the work that hours did in years gone by”). 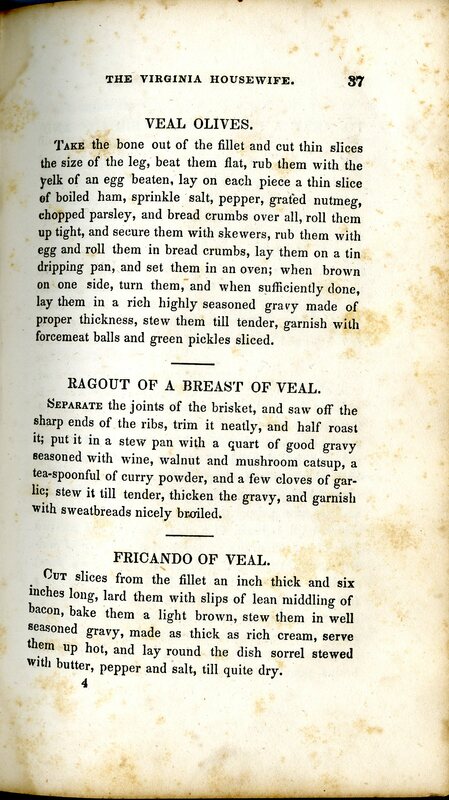 There is a whole section on oven meals, in which the whole dinner goes into the oven and finishes at the same time. 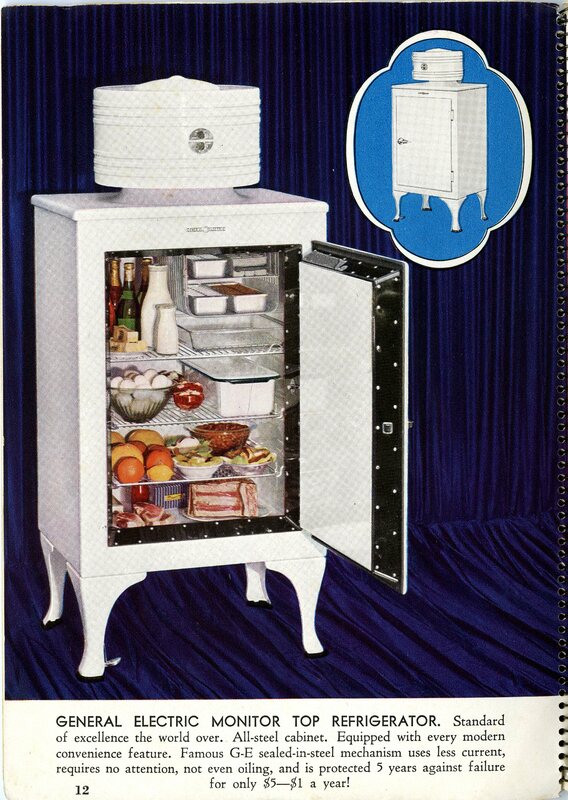 Many things can now be done in advance and stored in your refrigerator! Leftovers won’t be wasted, either! 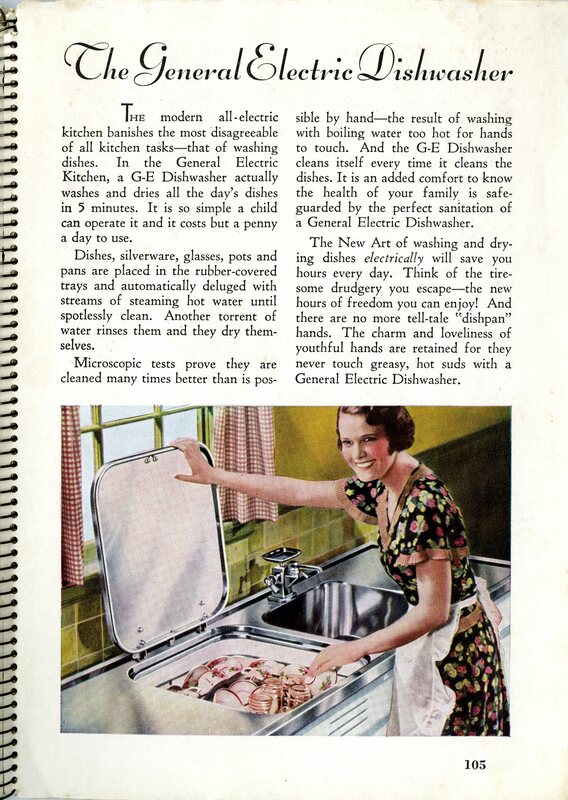 And the dishwasher will keep your hands out of that dirty water! 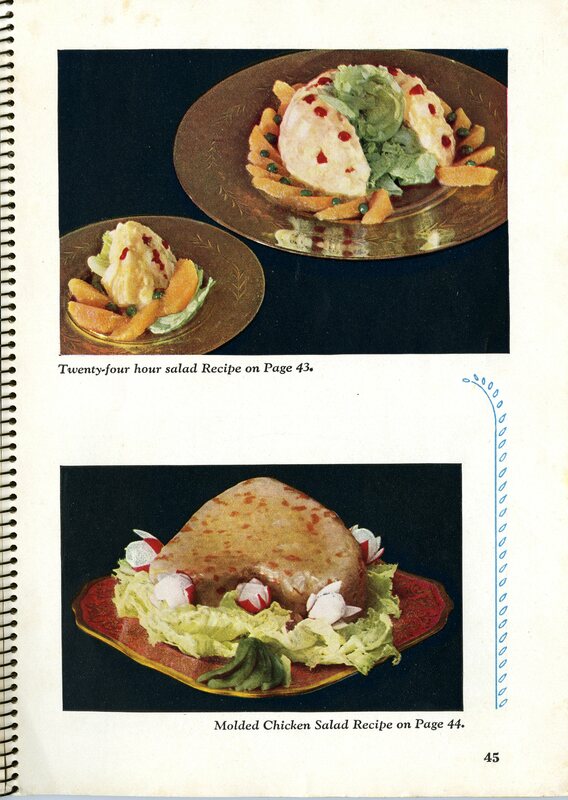 A few of the recipes may make you wonder (like many of those in our collection) just who thought onions rolled in bread and spread with mayonnaise resulted in a tasty canape or chopped chicken needed to be embedded in gelatin, but that’s always what makes this collection and these publications special. 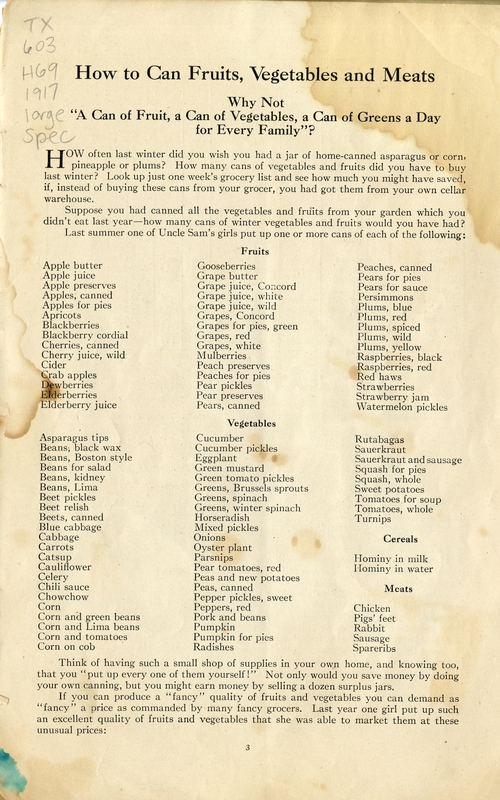 They offer us a window in a food past we don’t see today. It’s a bit challenging to pigeon-hole this publication into a single category. 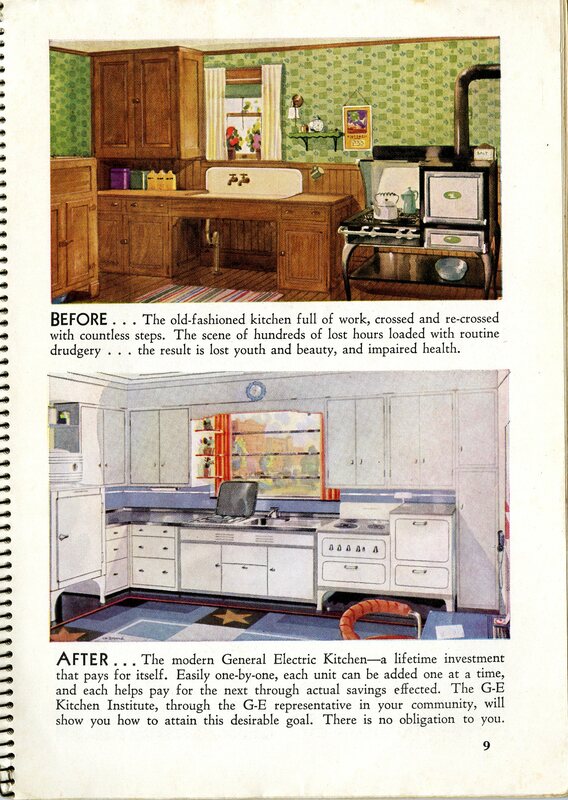 It isn’t just a cookbook, an advertisement for GE appliances, or a household manual. Rather, it’s a creative melding of all three–which is one of other reasons to highlight it this week. 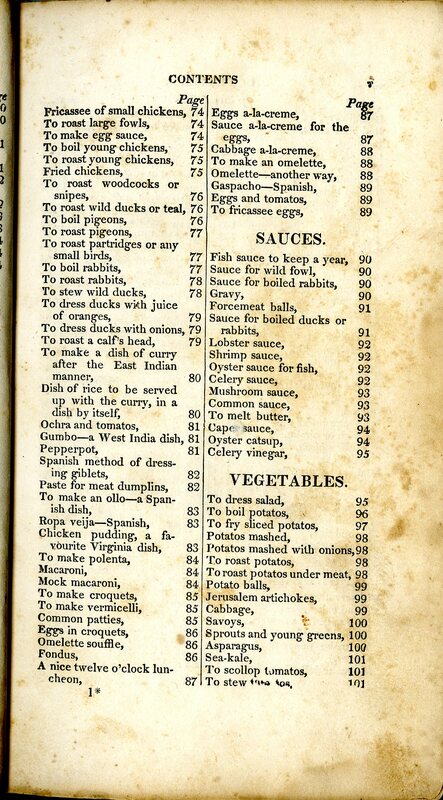 We’re gradually starting to think about our culinary collection in a new way here at Special Collections. Instead of defining it simply in terms of formats (books, manuscripts, educational kits, electronic resources, etc. ), we’re trying to imagine it in terms of topics. 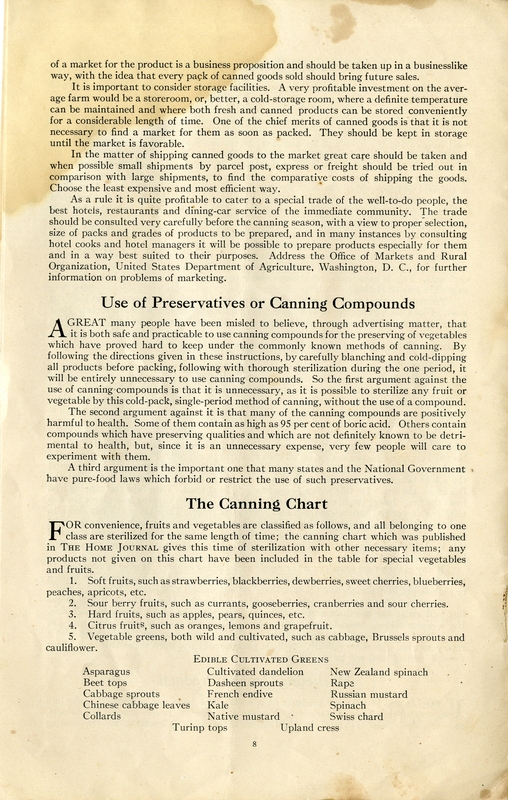 While that could potentially be a long list, we’re noticing there are some distinct themes among existing holdings: receipts & recipes (including home remedies); dietetics, education/home economics & nutrition (children and adults); household management & social history; technology, food processing & preservation; and entertaining & the history of the cocktail. 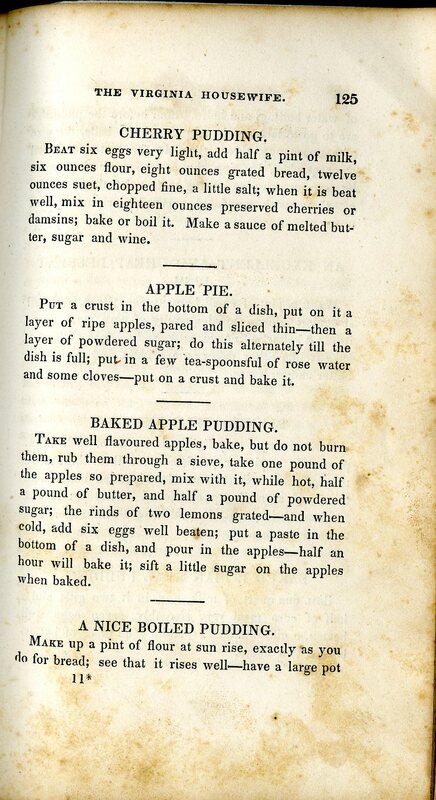 We’ll be sharing more about some of these themes on the blog in the weeks to come, as well as serving up our usual fare of recipes, history, and a little gentle fun, so be sure to stick with us. This week, I’m giving our loyal blog readers something a little different. 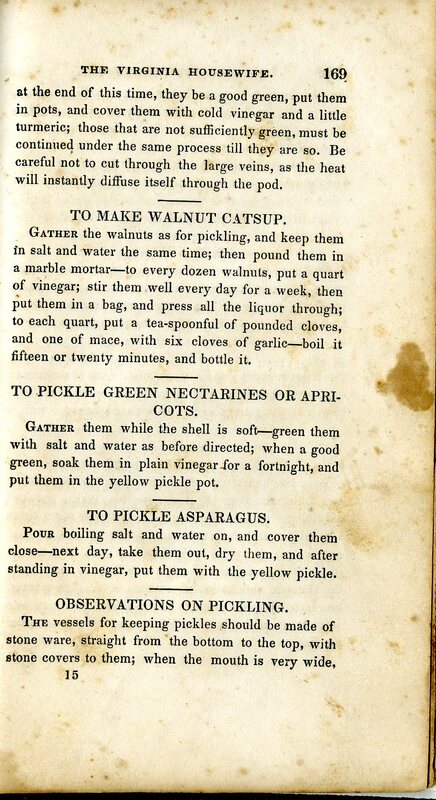 Yours truly, archivist/blogger Kira, was invited to give a presentation on the culinary collection to library staff and faculty as part of an in-house training day. Happy (as always) to share the collection, I spent an hour yesterday sharing images of items, talking about how we’re re-imagining the collection, and poking a little good-natured fun. We’ve spent a lot of time thinking about and describing all our collecting areas in terms of formats, but we’re trying to break away from that model. Instead, we’re beginning to talk about collections and collecting areas thematically. 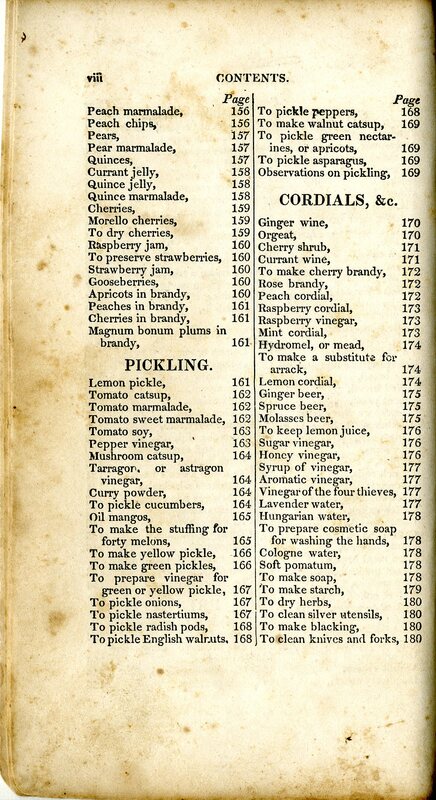 Whereas we used to talk about the culinary collection in terms of books and manuscripts, we’re now talking about it in terms of larger themes: receipts and recipes, domestic/social/economic history, the history of cocktails and entertaining, changing food technology and processes–just to give a few examples. The presentation I gave was almost entirely image-based, so I’m including it here. It has a nice cross section of the collection. Springsteed, Anne Frances. 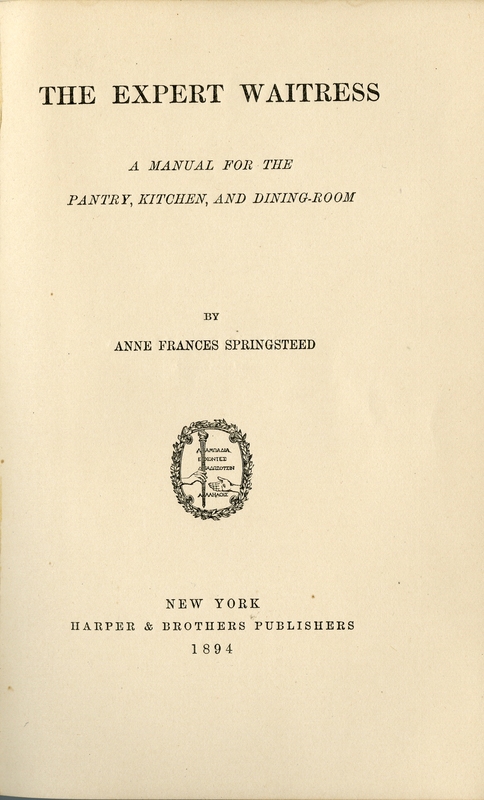 The Expert Waitress: A Manual for the Pantry, Kitchen, and Dining-Room. New York: Harper & Bros, 1894. 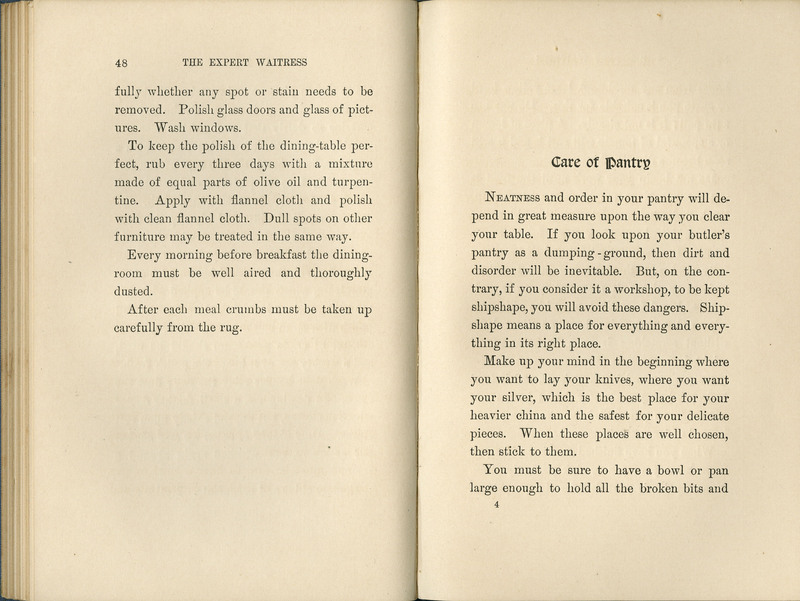 When it comes to household management, there are more than just books for the “lady of the house.” The 1894 book, The Expert Waitress:A Manual for the Pantry, Kitchen, and Dining-Room, is aimed at the female domestics working in the kitchen and dining room. 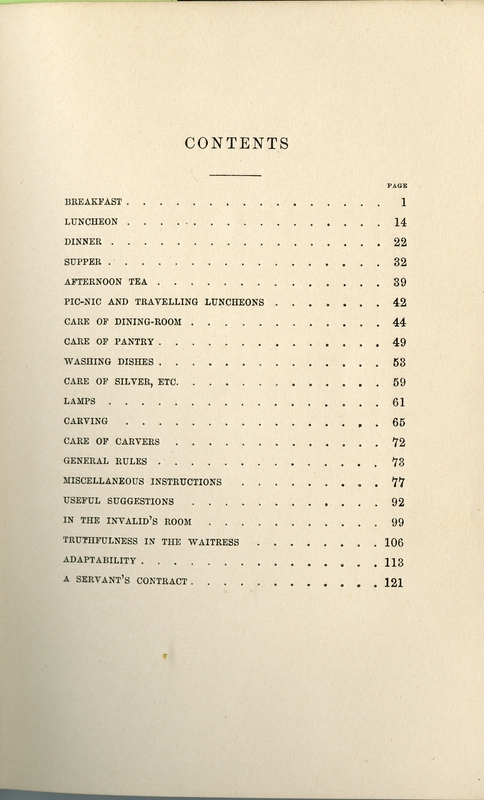 This manual covers everything from detailed meal service and washing the silver to personal presentation and additional skills a waitress should have to improve her role in the household. 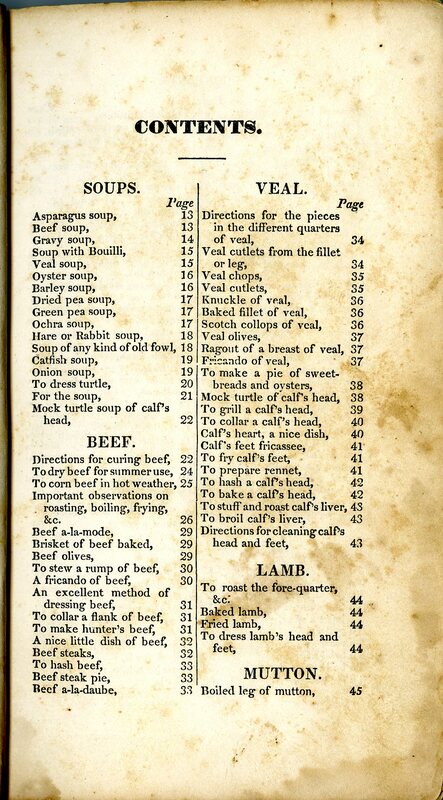 Sadly, no pictures this week, although the book does include some helpful charts showing what dishes and flatware are required for what meal. 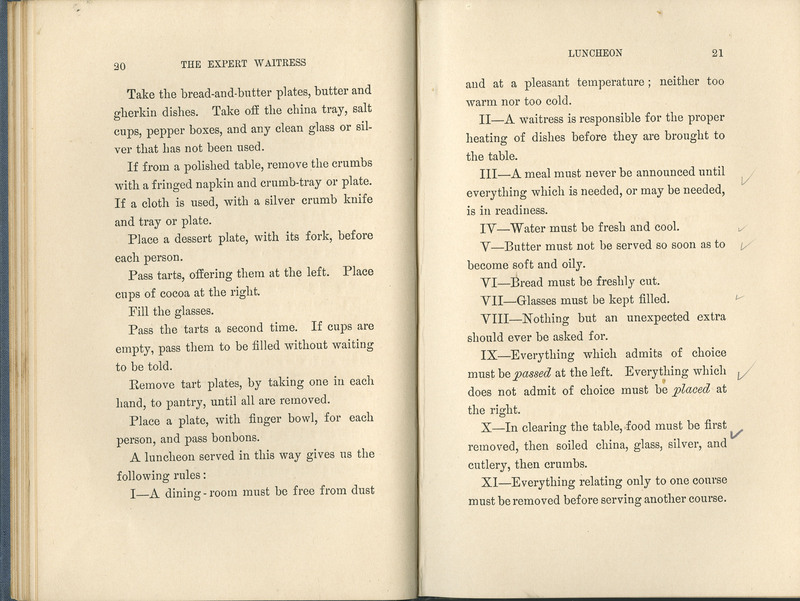 Just about the only thing missing, with all the book’s details on where to put what dishes during a meal and how to set a table, are diagrams of the actual table settings! 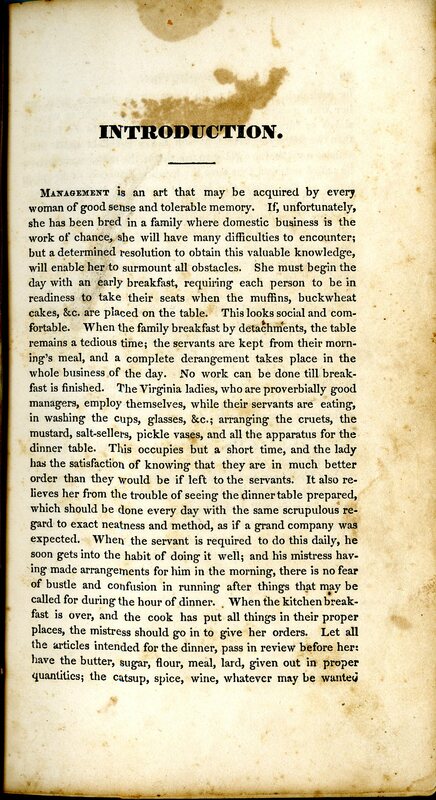 The pages above are from a number of different chapters, including those on serving luncheon, on keep the pantry “ship-shape,” on being indispensable in the home through other skills, and on the conditions of the contract for a servant. 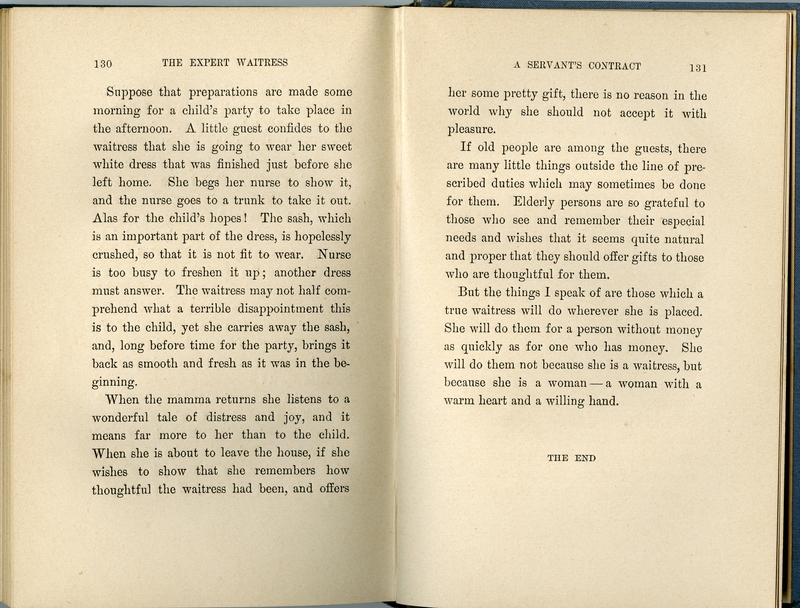 Some particularly striking quotes caption the images in the gallery (click on the first image to open the gallery). 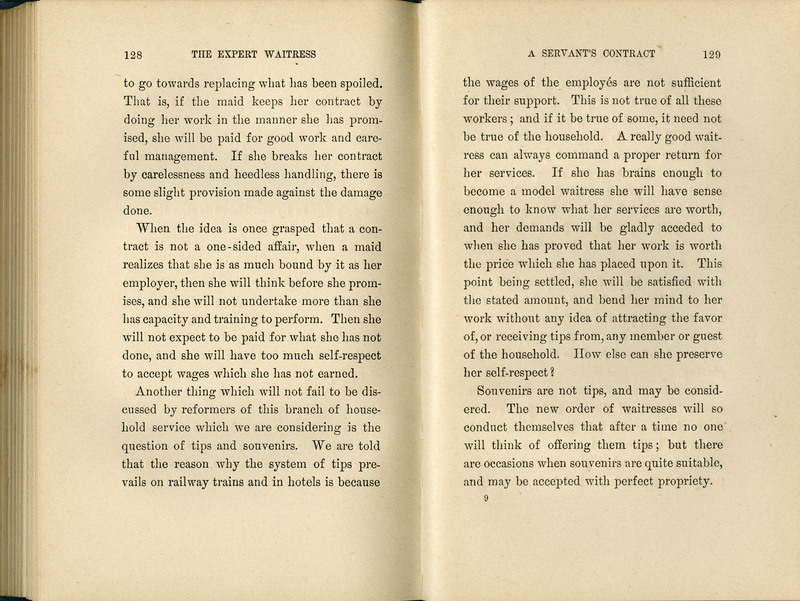 While The Expert Waitress may not have practical applications today, it does offer a detailed look at one specific role in the late 19th and early 20th century household. One that, if absent, would have left everyone hungry! Our copy is one of about 40 in public or academic hands, but one of only 2 in Virginia libraries. However, if you can’t get here to see it, this book is also available online via the Internet Archive or the Hathi Trust Digital Library.